Mr. Olufemi Adesegun Adekaiyaoja was born on the 16th December, 1961 in Manchester, United Kingdom. He is an indigene of Ikorodu in Lagos state. He attended Home Science Association School, Ikoyi, Lagos in 1974 for his primary Education and then proceeded to Government College, Surulere, Lagos from 1974-1979 for his secondary Education. He then went to Federal School of Arts and science, Victoria Island, Lagos and School of Basic Studies of the Polytechnic Ibadan for his advanced level studies before gaining admission into the University of Ilorin, where he graduated with a second class honours Bachelors degree in Biochemistry in 1987. He did his National youth service in 1987-1988 where he was posted to serve at Government Comprehensive Secondary School in Uba in Askira LGA , Borno state, Nigeria as senior chemistry teacher. His working career began in the private sector where he was first employed as a sales representative at Nigerian Laboratory Company Ltd, Ilupeju, Lagos in 1990 and as a production and quality control chemist at Supreme oil industries, Ilesha in Osun State, Nigeria from 1990-1993. He further worked at Churchgate Nigeria Ltd, Victoria Island, Lagos, a conglomerate firm, with the procurement unit of the project department from 1994-1996 and also as a Scientific Officer with Najco Laboratories Ltd, Isolo, Lagos, a firm of public analysts on and environmental consultants in 1996-1997. He got employed by the Lagos State Civil Service Commission in March 2000 where he was posted to Lagos State Environment Protection Agency (LASEPA) as Scientific Officer with the Potable water and Land and soil Laboratory as well as in the Pollution Control Department. He was head of the zonal office of the Agency at Ikorodu, Lagos in 2011-2012. 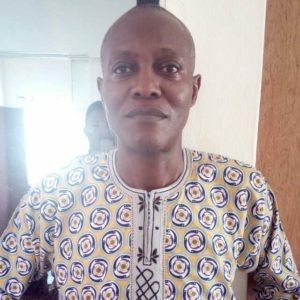 He was posted to Lagos State Safety Commission in February, 2012 where he was assigned to perform duties in compliance, monitoring and enforcement. He was in charge of safety Monitoring, Surveillance and Inspection and is presently an Assistant Director in charge of the Policy, Standards and Monitoring Directorate. He has undergone professional training and qualification in Occupational Safety and Health and is a member of the Nigerian Environmental Society. He has also attended a number of management and capacity building programmes. His experiences in laboratory analyses, quality control and as a Safety, Health and Environment professional both at the private and public sector has contributed to the development of Government policy decisions in the field of environmental pollution control, and implementation of environmental laws, safety policies and standards and monitoring compliance to safety laws, guidelines and regulations. Mr Adekaiyaoja Olufemi is happily married and blessed with two children.